Turon na Saging(Banana Spring Rolls) is sinfully addictive and can be eaten as a afternoon snack or dessert after a meal. Very easy to cook at home but in the Philippines, Turon na Saging is also available for sale as one of the street food snack/dessert. Best eaten freshly cooked while the wrapper still possess that crispiness and have that slight crunchy toffee glaze. It is pure ecstasy what’s inside, the slices of saba bananas and jackfruit soaked in melted sugar syrup. But note of warning, just be careful eating it as the filling can be still hot while the outside has cooled down a bit. “Turon” is the term called for this sweet spring rolls in the Philippines and “Lumpia” term is usually used in savoury spring rolls. I remember there was a segment in Ready Steady Cook and one of the chef called his version of “turon” a “lumpia”. I don’t know why, but I felt cringing and if I was in the audience would have shouted “IT IS CALLED TURON FOR HEAVENSAKE and btw, can I throw my ladle to the Filipino who told you that it’s a Lumpia?”. I know am being too harsh but it’s like calling “congee” a “risotto”, might be similar in some ways but totally different from each other. Sometimes when a word is lost in translation, it is very hard to straighten it out if we don’t fix it quickly. Maybe I’m just crazy or am I right? Saba is the best bananas you can use making Turon na Saging. This bananas can be purchase fresh or frozen. Most Filipino stores in Brisbane sales the frozen saba but to my delight sometimes by luck I find fresh ones in Amigas Asian Store in Cannon Hill. A bit pricey compare to the frozen ones but the taste is way nicer and has that natural sweetness. Some people use normal eating bananas when there are no saba bananas available but personally I don’t make this sweet snack if I don’t have either frozen or fresh saba as I don’t like the taste that lingers in my tongue/palate when I eat cooked normal bananas. ~ Peel fresh Saba bananas and cut each banana into 3 slices. To make the cornflour paste, mix 1 tspn of cornflour into 2 tbspn water. Microwave for 5-10 seconds and stir well once you take it out. ~ Coat the slices of bananas and strips of jackfruit with brown sugar. In a large plate, layout the spring roll wrapper with one of the corners facing you. Place 2 slices of Saba bananas and about 4-5 slices of jackfruit in the middle of the wrapper. With the corner facing you, fold it over and tuck it in underneath the filling. ~ Fold the sides and tightly roll the wrapper away from you. Smear some of the cornflour paste on the expose corner and complete the roll. Repeat this process till you finish all the spring roll wrappers. ~ Heat the cooking oil in a medium saucepan and deep fry the turons, lower heat if the turons are browning too quickly. Cook till its golden brown. Please drain in a large metal sieve as placing turons in absorbent kitchen paper towel will result in pieces of paper sticking to the glaze. Serve immediately. Coating the bananas and jackfruit with generous brown sugar will give you that delicious toffee glaze outside the turons. If you’re cooking in batches (eg. 3-4 at a time) and your oil in the pan has lots of floating dark toffee bits, remove it by skimming with a ladle and disposing it. Another alternative is use another saucepan and sieve the hot oil with a metal mesh strainer to get rid of the floating toffee between batches. This is to avoid burnt toffee (gives a bitter taste) coming into contact with the turons. BEST WITH: Vanilla Ice Cream. turon is my absolute favourite Pinoy dessert! You're just in the neighbourhood pala! 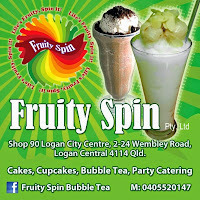 I'm glad to be know another Fil-Aus food blogger based in BNE! Yes, hehehehhe .. glad I visited your blog (btw, love reading it), you're the only one I found so far and hopefully, wish there are more of us out there...in BNE. you made me crave for turon... and banana que, hahaha. I love turon with the langka... now plus the vanilla ice cream pa? OMG! YUM! nakakagutom po. gaganda ng photo...keep it up po. Of the many turon recipes I've looked at today, yours is the first to mention how to properly get the sugar glaze on the outside of the turon. Finally, I can go shopping and make my first attempt at Turon. Thank you!! !